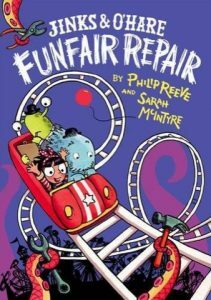 Jinks & O’Hare Funfair Repair is another madcap adventure from the dream team of Philip Reeve and Sarah McIntyre. What’s more fun than a funfair? A funfair in space, populated by weird aliens and stuffed with bizarre rides! When things start to go wrong, and even ace alien repairmen Jinks and O’Hare can’t keep up, it’s down to wannabe funfair repairer Emily to save the day – with a little help from her friends. Can Emily get to the bottom of the mystery? Of course she can! The sci-fi quotes and motifs really add to the fun, and they’re done right, too – the jokes are still funny even if you haven’t seen Aliens or Star Wars. Fun, frantic, inventive in both word and (sumptuous) illustration, packaged in a gorgeous little hardback volume, this is a perfect book for younger readers. Much as I enjoyed the earlier books in this series of unrelated stories (Oliver and the Seawigs, Cakes in Space, Pugs of the Frozen North), this is the best yet.